The most important places of pilgrimage in Buddhism are located in the Gangetic plains of Northern India and Southern Nepal, in the area between New Delhi and Rajgir. This is the area where Gautama Buddha lived and taught, and the main sites connected to his life are now important places of pilgrimage for both Buddhists and Hindus. However, many countries that are or were predominantly Buddhist have shrines and places which can be visited as a pilgrimage. Bodh Gaya: the place of his Enlightenment (in the current Mahabodhi Temple,Bihar, India). Sarnath: (formally Isipathana,Uttar pradesh, India) where he delivered his first teaching. Kusinara: (now Kushinagar, Uttar Pradesh, India) where he died. 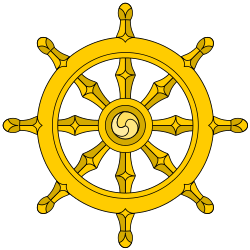 In the later commentarial tradition, four other sites are also raised to a special status because Buddha had performed a certain miracle there. These four places, partly through the inclusion in this list of commentarial origin, became important Buddhist pilgrimage sites in ancient India, as the Attha-mahathanani (Pali for 'The Eight Great Places'). It is important to note, however, that some of these events do not occur in the Tipitaka and are thus purely commentarial. Sravasti: Place of the Twin Miracle, showing his supernatural abilities in performance of miracles. Sravasti is also the place where Buddha spent the largest amount of time, being a major city in ancient India. Rajgir: Place of the subduing of Nalagiri, the angry elephant, through friendliness. Rajgir was another major city of ancient India. Sankassa: Place of the descending to earth from Tusita heaven (after a stay of 3 months teaching his mother the Abhidhamma). Vaishali: Place of receiving an offering of honey from a monkey. Vaishali was the capital of the Vajjian Republic of ancient India. Some other pilgrimage places in India and Nepal connected to the life of Gautama Buddha are: Pataliputta, Nalanda, Vikramshila, Gaya, Kapilavastu, Kosambi, Amaravati, Nagarjuna Konda, Sanchi, Varanasi, Kesariya, Devadaha, Pava and Mathura. Most of these places are located in the Gangetic plain. Cambodia: Angkor Thom, Silver Pagoda. Tibet: Potala Palace, Mount Kailash, Lake Nam-tso. Myanmar: Bagan, Sagaing Hill, Mandalay Hill, Kyaiktiyo Pagoda, Shwedagon Pagoda. Sri Lanka: Anuradhapura (the Atamasthana or 'eight places'), Mihintale, Polonnaruwa, the Temple of the Tooth (Kandy), Sri Pada. Thailand: Phra Phutthabat District, Sukhothai, Ayutthaya, Wat Phra Kaew, Wat Doi Suthep, Phra Pathom Chedi, Phra Buddha Chinnarat. United States of America: City of Ten Thousand Buddhas - Largest Monastery-Nunnery in USA in terms of numbers of ordained monastic Bhikshus and Bhikshunis. First full ordination on American soil. Garden of 1000 Buddhas, with beautiful statuary and gardens, near Missoula Montana. ↑ The Buddha mentions these four pilgrimage sites in the Mahaparinibbana Sutta. See, for instance, Thanissaro (1998) and Vajira & Story (1998). "Buddhist Pilgrimage". Asia. Victoria and Albert Museum. Retrieved 2011-04-03.